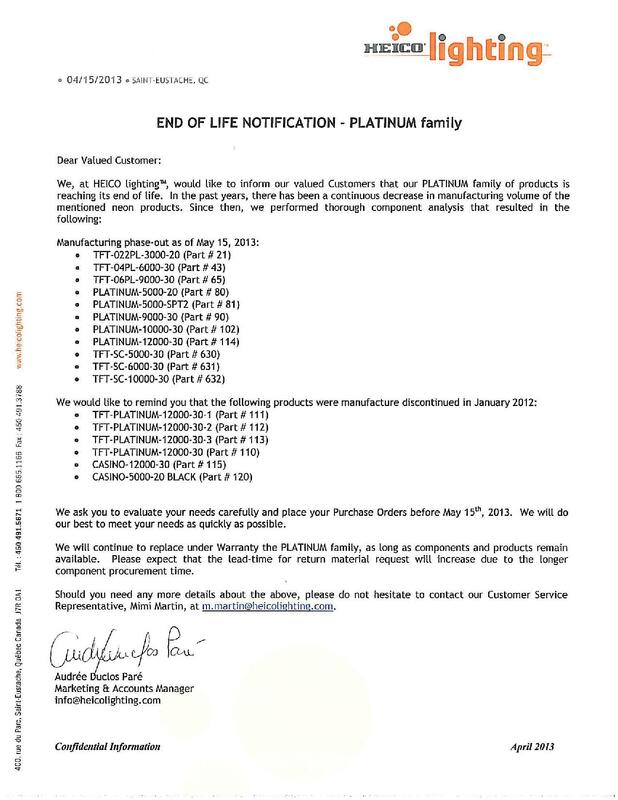 Please be advised that HEICO lighting™ is voluntarily recalling its PLATINUM series of neon transformers manufactured between December 2011 and May 2012. To view the public announcement of this voluntary recall, please see below. The above PLATINUM transformers with the above date codes need to be replaced with equivalent new PLATINUM transformers meeting the UL requirements. The new PLATINUM transformers will be provided free-of-charge by HEICO lighting™. If you have a neon sign with one of the transformers described above (either in your inventory or at your customer’s site), please contact your distributor to arrange to have the transformer returned or replaced. HEICO lighting™ apologizes for any inconvenience this recall causes you and appreciates your cooperation. * For Canadian customers, it is possible to download the Electrical Safety Authority press release by clicking here. Hazard: The transformers do not meet the UL standard for this product and pose a fire risk. Consumer Contact: HEICO lighting™; toll-free at (800) 665-1166, from 8:30 a.m. to 5 p.m. ET Monday through Friday, or online at www.heicolighting.com and click on Products for more information. Description: This recall involves neon power supply transformers designed to power commercial signs. They are in black plastic boxes about 4.5 inches long by 3.5 inches wide with rows of vents on all sides. 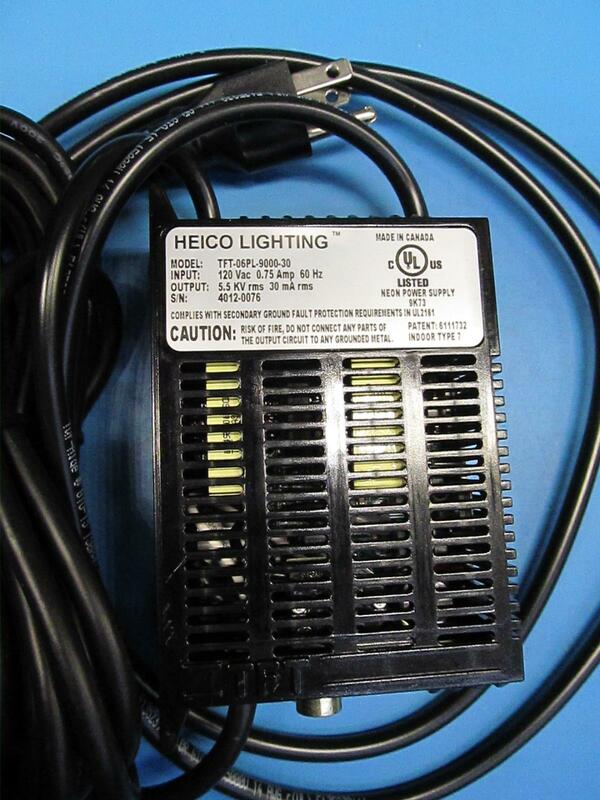 “HEICO LIGHTING™” and the model information are printed on a plate on the transformer. The recalled models include PLATINUM-9000-30, PLATINUM-10000-30, PLATINUM-12000-30, TFT-04PL-6000-30, and TFT-06PL-9000-30. Remedy: Consumer should stop using these recalled power supply transformers and unplug them immediately until a free replacement transformer has been professionally installed. Contact HEICO lighting to schedule the free installation of a replacement transformer. Sold by: HEICO lighting directly to ten distributors nationwide from December 2011 through May 2012 for between $60 and $150. Distributors: Denco Sales; Graphic Solution; Hart Supply; Interstate Electric; Montroy Supply Co; N.Glantz & Son; Pioneer Supply; Reece Supply Co; Sun Supply; Tubelite Co. Photos will display in a slideshow at the top left of the recall.